The PAX: Chubbs, CapGun, Shocker, Fireball, Baby Ruth, Heist, Pipeline, Bloodwork, Copay, Foxhole, Heidi, Corndog, ?? Hump day has arrived, and, for Stumblers, Wednesdays mean a longer-ish run. 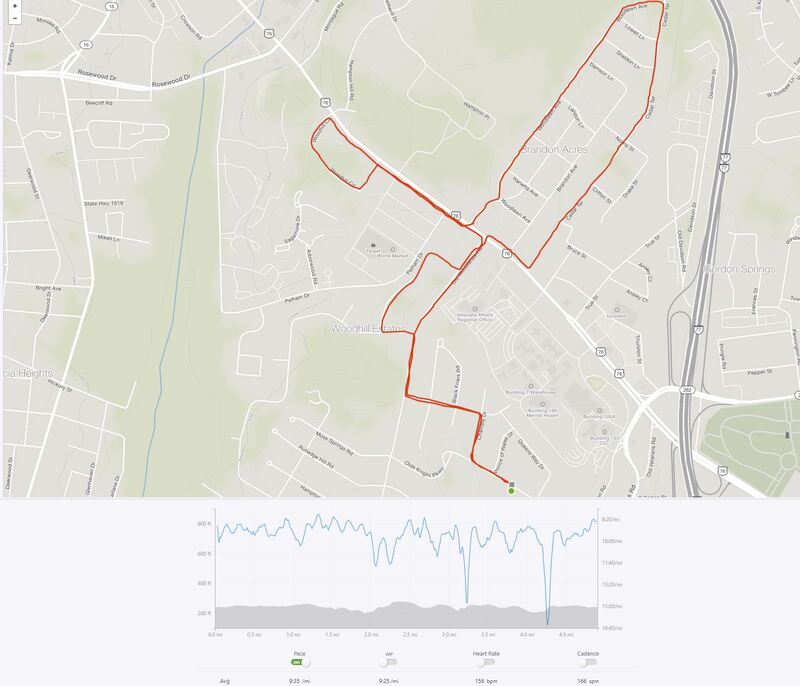 My goal was pretty simple — 1) make the route fun, 2) make it so it sorta swings back toward the AO to pick-up @F3Armory guys, and 3) make it with enough turns that Heist might get lost. All goals were met and Heist took Corndog along for the his ride down the wrong path. YHC also tried to throw in a few hills along the route to make up for Monday’s flat route. Conditions were not terrible. It was cold. It was foggy. But we warmed up pretty quick. 5-mile route: From the AO – to Garner’s Ferry via Chambly, Queens Way, and Old Woodlands. Right on GF — cautiously across GF — to Cedar Terrace. Left at Cedar Terrace to loop around the Legion AO and down Woodlawn Ave back to GF. Right on GF toward MOM. Halfway down MOM turn left on Woodhill Circle. Loop around the circle back to GF where we turned right back toward Old Woodlands. Right on Old Woodlands and then the first right (Sallie Baxter Dr.). Loop around Sallie Baxter Dr. to the bottom of Indian Mound. Left on IM (up the hill) back to Old Woodlands. Then back to the AO via Queens Way and Chambly. God didn’t give Abram (later to be called Abraham) a map or show him a final destination. God said, leave your comfort zone, get off your father’s couch in the basement, and go. Move. Abram didn’t know where he was going, but he obeyed. Our faith grows when we follow Abraham’s example. Get out tomorrow – Teddy has Q at Woodshed; Rogue Runners meet at Starbucks at 5:15; Legion is just across the street . . .
On Friday, at Starbucks, the Stumblers are taking a picture with all Pax that met the 1,000 mile challenge for 2018. Heist may buy coffee. On Monday, Stumble is converging at the Bull for run and AOQ transfer from Co-pay to another . . .